Kids really need PLAY – that is their work!! At one point or another, we’ve all wanted to solve the world’s problems. Or maybe just one problem. Ironically, our ability to understand, connect and empathize with others around us and the world at large didn’t necessarily develop from our academic achievements. Our problem solving abilities were most likely developed through our childhood play. Academic achievement in college requires readiness skills that transcend mere book learning. It requires the ability to engage actively with people and ideas. In short, it requires a deep connection with the world. For a five year-old, this connection begins and ends with the creating, questioning, imitating, dreaming, and sharing that characterize play. When we deny young children play, we are denying them the right to understand the world. Play is central to children’s cognitive development. Play helps children learn concepts that adults may take for granted. We may understand cause and effect, or how to organize objects, or that an object under a blanket is still there even though we can’t see it. For young children, these ideas and others are new. Play is nature’s way of helping kids experiment with how the world works, how to think, and how to solve problems. Luckily for parents and caregivers, we don’t need to do much in order to help nurture our children’s cognitive skills. 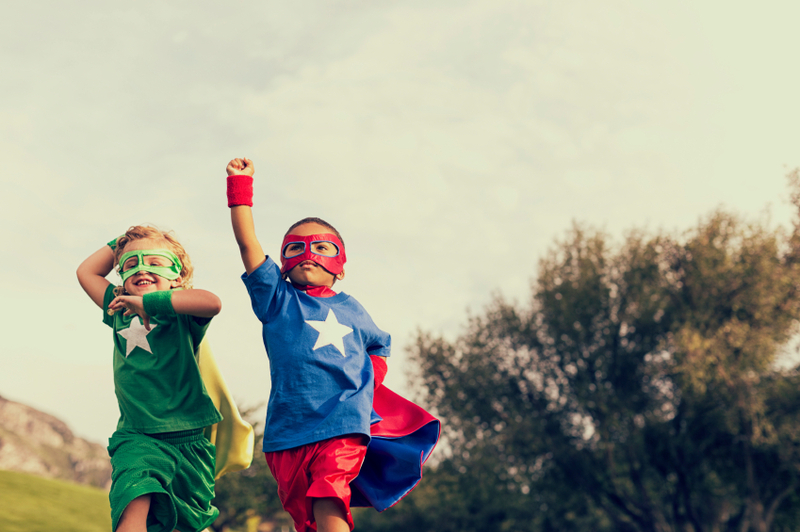 We just need to provide time and space for our kids to play make-believe, construct a cardboard clubhouse, take their doll’s pulse, create something, or run around the playground with their favorite superhero friends. For timeless toys that foster play and help build cognitive skills, visit your local neighborhood toy store. The toy experts there will be able to tailor ideas specifically for your child’s age and interests. What Makes Independent Toy Store Owners Smile? The Woohoo! Factor, powered by ASTRA, works closely with bloggers and media outlets to announce play and toy industry information. Visit our online media kit to learn more about The Woohoo! Factor and to download related materials. Halloween is our favorite holiday! Here is a neat idea which can add to the festivities! A Boo-Gram is a mysterious note, left on neighbor’s doors in the middle of the day. The note is usually a poem of sorts, and a large “Boo!” decoration for their front door. The decoration serves as a means of communicating to other neighbors that this house has already been “hit”. By Halloween, it is not uncommon to see Boo-Grams lining up and down the street on all the doors in some neighborhoods! Accompanying the Boo-Gram is a collection of goodies, determined by the giver. The goodies may vary from small Halloween treats, to kid’s toys. The magic of these Boo-Grams is the reciprocation of this gift, as it is expected that when you are “Boo’d”, you must “Boo” 2 other neighbors as well (after all, if you don’t like your “Boo” gift, you can always re-gift to another neighbor!). Adventurous types “Boo” their neighbors in the broad daylight or early evening hours, as it increases the possibility of getting caught… those familiar with the famous “doorbell ditch” prank of their childhood years will be happy to know that this tradition lives on, though the recipient gets a fun gift in the process. Many neighborhoods start in early October, however the common time to start seeing “Boo-Grams” is a couple of weeks before Halloween. However don’t wait for someone to “Boo” you – start the tradition in your neighborhood… you’ll be surprised how quickly the excitement spreads around the neighborhood!